When looking at greenhouse plans, you have a wide choice. Before you get lost in a pretty plan, there are a few things to think about. Price is important to many people. However, the choices you make about these important aspects will directly affect the price you pay for the final structure. The most important aspect to consider is size. If you just want a small space to overwinter houseplants, you do not need a full sized solarium attached to your house. A small greenhouse in the backyard might be enough. If you want to grow vegetables throughout the winter, a greenhouse attached to your home might actually work better than one in the backyard. You can find plans for different sizes so you can select the one for your needs. Location is another important aspect of selecting greenhouse plans. Greenhouses need sun. That is something you cannot avoid. South and southeast sun exposure is idea. You do not want strong shade on the structure since that will block the sun. However, it is important to make sure there is not too much sun in the summer afternoons as that can actually make things too hot inside. Deciduous trees make good cover for afternoon sun. GET INSTANT ACCESS TO THE BEST GREENHOUSE PLANS HERE! When looking at greenhouse plans, you want to consider materials as well. Materials will help determine the final cost as well as how you build the greenhouse. You can get a beautiful permanent structure attached to your home, made from glass and steel. However, if you want a structure that costs less and may not be so permanent, you might want to consider something made from PVC with plastic sheeting stretched over it. There are several options in between these price points though. Price also depends on the type of foundation you select based on your selected greenhouse plans. A permanent foundation is essential for glass greenhouses. With a PVC frame, you can get away with posts driven into the ground. A permanent foundation usually means poured concrete along the perimeter. If you attach the greenhouse to your home, you always need a poured concrete foundation. The entire floor should not be concrete however. A wet floor can become a safety issue. You can put in a center walkway of concrete or gravel. It is important to regulate the temperature inside the greenhouse. Heat is important, but too much heat can cause problems with plants. 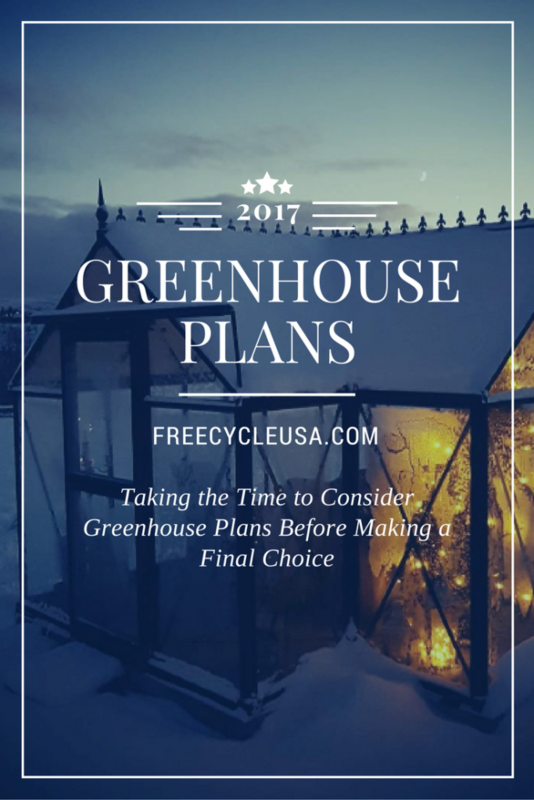 When looking at greenhouse plans, you need to look at whether the plan offers options for environmental regulation. For a greenhouse attached to the house, you can tap into your home's heating system. For a separate building, you can use a combination of venting, fans, and heating elements to keep the temperature at the right level. Air circulation and ventilation is as important to a greenhouse as heat. Plants are living things. They need fresh air. If you attach a greenhouse to your home, you need to be able to separate the space from the living area. This will allow you to vent the greenhouse without venting the rest of the house. Fans are part of air circulation. Many greenhouse owners like getting up each morning and tending their greenhouses. They can use manual systems to open and close vents as well as turning on and off heating elements. However, most gardeners cannot spend a great deal of time in the greenhouse. They may not be home during the middle of summer to ventilate the greenhouse space if it gets too hot inside. Using modern automation in a greenhouse space is one thing to consider. Some greenhouse plans consider this, while others do not. Watering is another function some choose to automate. There are automatic watering systems available.